devorelebeaumonstre.com | Pittsburgh, PA | Fashion & Personal Style Blog by Stacey Belko: floral & flannel. Love these shoes, hate that they're a size too small. Hate that wholesale-dress.net has fucked up every order I've ever placed with them. Like sending me these shoes in a size smaller than I ordered because they were out of the size I actually ordered so they just assumed sending me a size smaller would be okay? No, it's not okay. My little (big) feet are squished. & then they refused to refund me because they don't "do" refunds. That's a whole lotta BS. I LOOOVE THOSE SHOES!! So cool! wow that's so annoying! but they look awesome... so that's always conflicting. Man I will steer clear of them! Love the super 90sness of this outfit. That's a YSL ring, isn't it? I loved those so much when they first came out! And I still love that peace sign on your finger. I am too chicken to actually get a tattoo, but if there's ever a semi permanent tattoo that is more intense than henna, I'd totally get a small peace sign on my finger. I love this combo. I think I might be the luckiest person in the world when it comes to Wholesale-Dress.Net. Everyone has horror stories but me. That dress is absolutely adorable. A few years ago, when I wrapped one of my jackets around my waist, my friend just stared at me and asked if we were still living in the 90's. Haven't done it since. Jeez it looks so cute with your outfit, though. And that's a damned shame about the shoes, because they are sweet. Amei seu vestido...o blog t show...ja estou te seguindo. passa lá no meu e segue tbm. I love your hair and flannels are my favourite! crapster. I cant believe they just sent you a size smaller shoes. In what lame brained world does that make any sense?! Too bad shoes are too small, because they look amazing on you!! Love the whole look, and that tattoo replaces every million dollar ring. And a big thank you for the kind words on my blog. Love the look, and I really like your shoes! I like this combo. The print of that dress is great! totally amazing mix of prints! i love mixing floral and flannel, which is not an easy thing to pull off. fab. now following! That is a cool look! GREAT GREAT GREAT shoes! And thanks for the blog comment... would love if you'd follow me back! Totally loving this look. So chic and it reflects so much ATTITUDE. love it. Eu amo estampas florais!!! beijo. Love the pattern and color mixing! Gorgeous! Looking fab, darling!! Thank you for comment! Love your Print and fabric mix! It is a very nice dress and like the accessories too. those shoes are so perfec as is the rest of the look. I seriously want a dress like this! Love your dress and rings! Again you have an amazing style! I like what you post. I hope you have time to check out my blog. great outfit! i really like it. Gorgeous fabrics/garments mixed together,it works and look gorgeous! Your gress is gorgeous, I love the beautiful flower print design on it. Oh man, I can wear tight stuff for anything except shoes too! I hate the feeling of pinched toes! Thanks for the outfit post. oh my goodness your outift is truly amazing, love this post. Love your jewellery, I´ve got the very same asos cross shaped ring! Love the one with the green stone as well, crushing big time here. Thanks for stopping by my blog and for commenting btw! I´m folllowing you now, do follow me if you like my blog 2! OMG!!! I love your style!!!!! Amazing outfit and hair!! That dress & shirt look excellent together. Also love that spikey bracelet. Gracias por visitarme... me ha gustado que estuvieses en mi Jardín un ratito... Bsukis!! 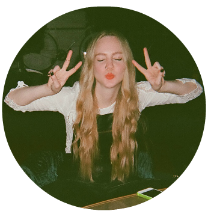 Following you at bloglovin and google ! 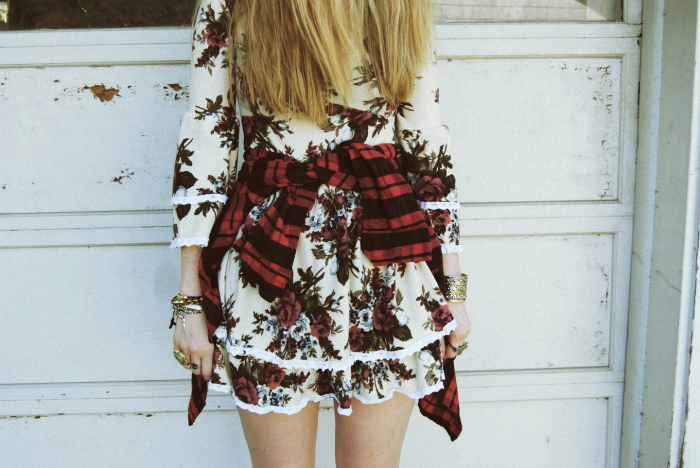 Really loving the plaid + floral! Hey interesting match of floral with checked with the shoes! Thank you for the comment on our blog! Hope u drop by again! i need to ask you..where did you buy your Arty ring?im kind of being mad cause i dont know where to buy it! Love your outfit! Sorry about the shoes, they look great though!! What amazing outfit. Ecleptic and trendy. ¡you are brave! The shoes are lovely! It's too bad they're too small. I've been hesitant to order from Wholesale-Dress and this has just sealed the deal for me that it's a bad idea. Hopefully your shoes will stretch out?!! But you you have scared me. :) What size do you usually wear and what did you end up getting? I am confused by the sizing on there! Agh! Oh, you are super cute! This outfit is perfect, love it and I love your blog!! !New follwer! Your accessories are just lovely! really nice and unique outfit! I hadn't seen your shoes before. Great outfit!